Dream Home is an interior design app that allows you to view all the latest trends in hopes that you can draw ideas from the pictures in the app for your own interior designing. The developers at MYW Productions have included various pictures of rooms for you to browse through. You can view interior designs by color, with choices from white to wild bright. Or choose from the different styles: traditional, modern, contemporary, country, art deco, shabby chic, Tuscan, and cultural. To scroll through the choices just drag your finger across the iPhone screen. You can also view the most popular designs. The decorated rooms range from bathrooms, to living rooms, to bedrooms – they even have a fireplace decorated. If you find a room you’re especially into, you can mark it as a favorite, and you’ll be able to access the picture in your favorites collection. I’m not sure how each room that is selected to be in the popular category. When I tried to rate the designs by pressing the rate button, nothing happened. After you select criteria to look through, be patient, I’ve waited up to one minute for the pictures to load, other times I just gave up and tried a different route. It would be nice if each designed room had the information of who designed it. At the iTunes store, the description for Dream Home says their pictures come from the work of professional designers, but no names are credited for their work on the app. I think this would be helpful so users can not only draw inspiration from the app’s pictures, we could also learn who it is we’re interested in, to do more research for our designing process. When you view each picture of a room, you have the option of zooming in for a closer look, but when you do, the resolution is lost. Also, an email option would be great in this app, especially since we’re browsing through so many pictures, it would be nice to email certain ones instead of just saving them to the favorites section in the app. I love the idea of the app, if the developers worked a bit more on the options, it could be a great assistant to those who are planning their Dream Home. 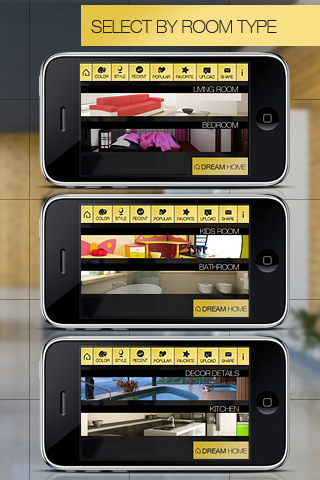 AppSafari review of Dream Home was written by Amanda McFarland on May 21st, 2010 and categorized under App Store, Homes, Productivity. Page viewed 3528 times, 1 so far today. Need help on using these apps? Please read the Help Page.